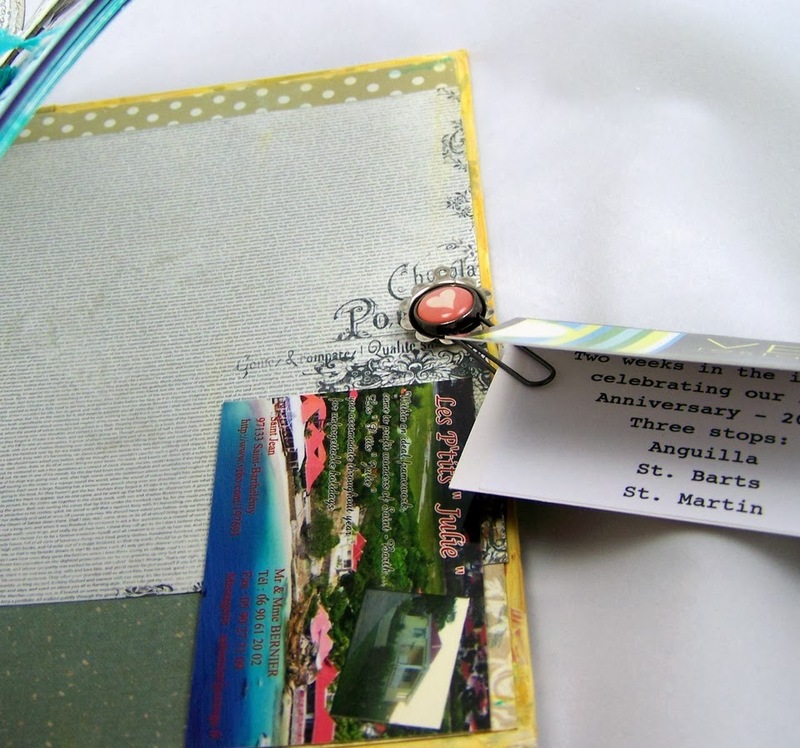 Have you seen our new format for our eclectic Paperie ePlay Challenge? You can check out all of the details here! We hope you come play with us for your chance to win a $25 gift certificate to the eclectic Paperie Shop! Our ePlay Challenge lasts until March 26th. The challenge is to alter a book. A journal book I would never use, with plain pages inside. 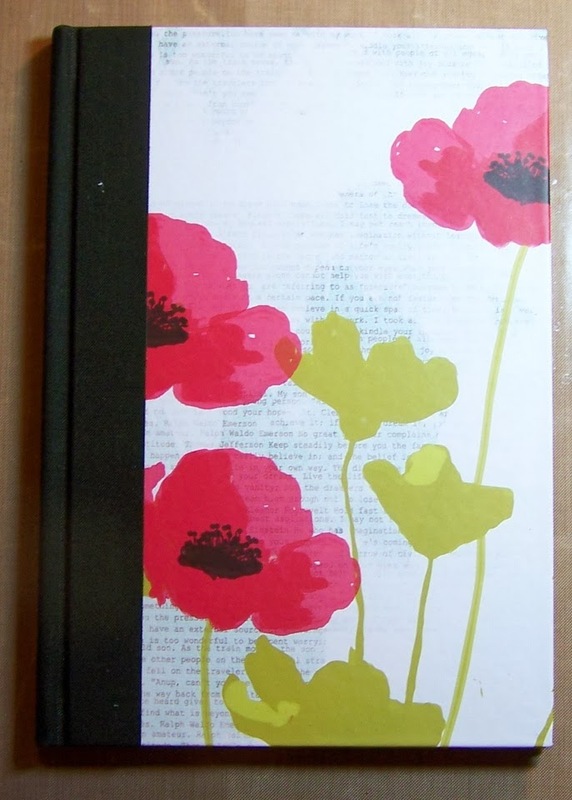 I covered the entire book with Liquitex Gesso to cover all of the print, flowers, and the black binding. 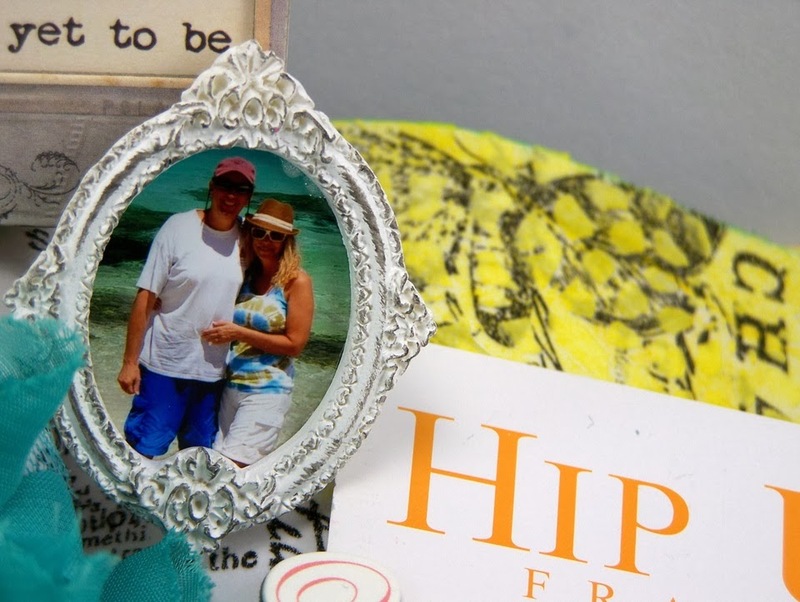 I had so much FUN altering this book to highlight a two week trip that my dh and I took in 2012 to the Caribbean. We had such a great time! 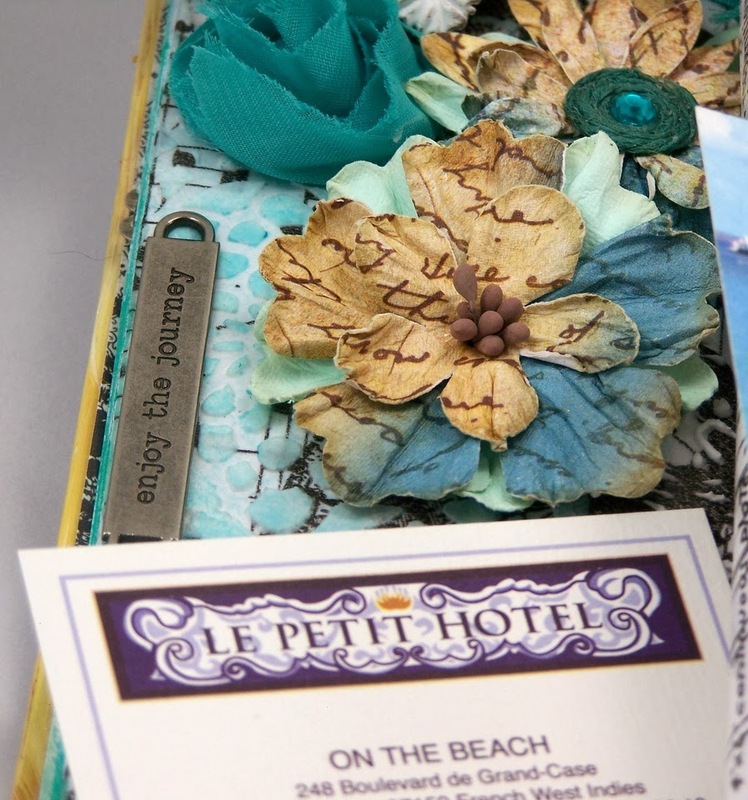 I collected cards from various hotels, restaurants, and stores and put them in this altered book. I used a scrap piece of TH Tissue Wrap called Melange and adhered it to a piece of chipboard with clear gesso. I rounded the corners and swiped Guatemalen Green Silks Acryllic paint around the edges and the butterfly. You can also see the Wendy Vecchi white embossing paste I applied through the Wendy Vecchi stencil for my BG. LOVE! I also watered down the green silk paint and splattered paint all over the yellow BG. I have named this altered book "Our Story." 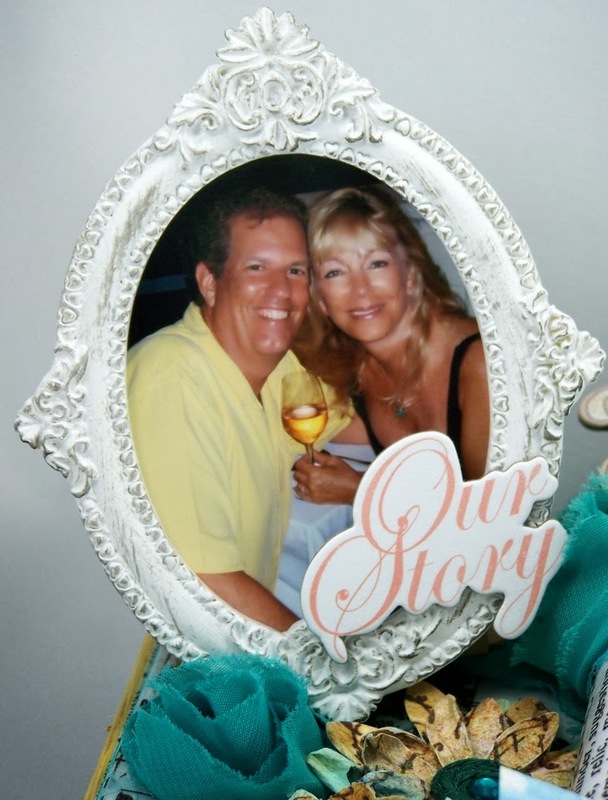 I used this FAB Prima resin frame so our happy photo would stand out. Here you can see the Golden Titan Buff paint I used on the book edges and the pretty Petaloo flowers. I also added the TH idea-ology word band, "enjoy the journey" because "the journey" was my trip AND "the journey" is my life with my dh. 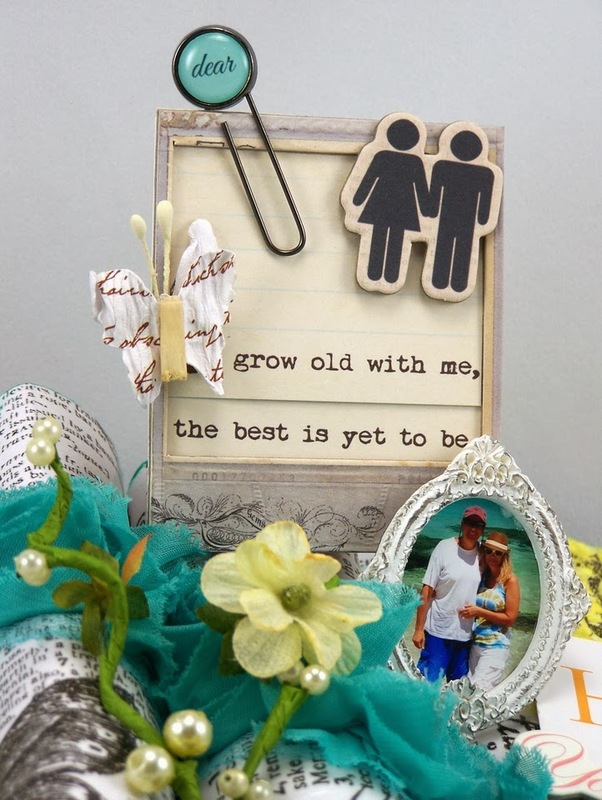 The chipboard people, frame, and words on my book are from the Prima Something Blue collection. I also used a Petaloo butterfly, another Prima resin frame (they come in a two pack), and a Prima Princess Typewriter Key paperclip that says dear. You can also see the Petaloo Botanica flowers with the pearls and the stems. 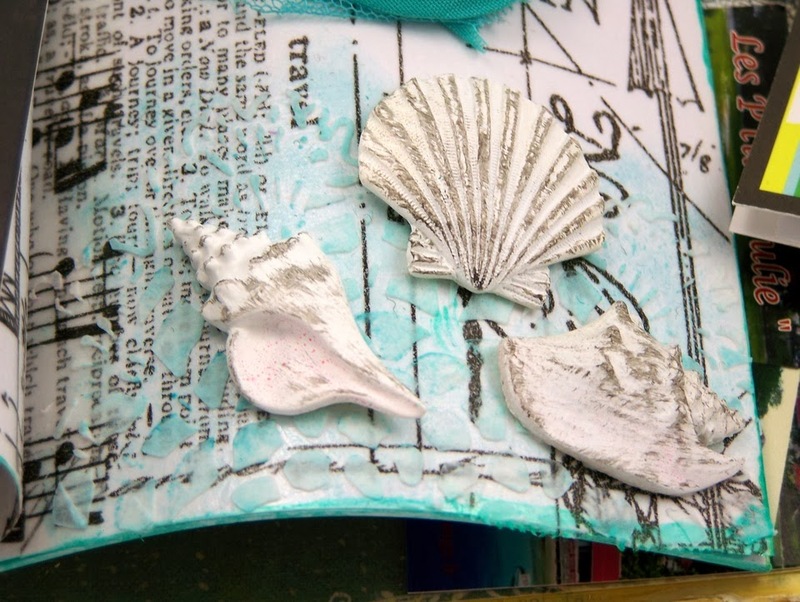 Another of my new FAV products are the Prima resin seashells! Perfect for any beach trip design! Can you see the Spun Sugar Distress ink I put on the "inside" part of the shells? Love it even though it's subtle! I also used a Prima doily stencil, some Wendy Vecchi embossing paste, and Tumbled Glass Distress paint under the shells. I LOVE the texture this adds! I also wanted you to see the Mustard Seed Distress Ink I put over the Wendy Vecchi white embossing paste I applied through the Prima lace stencil in the upper right hand corner. This is my little spot of sunshine! 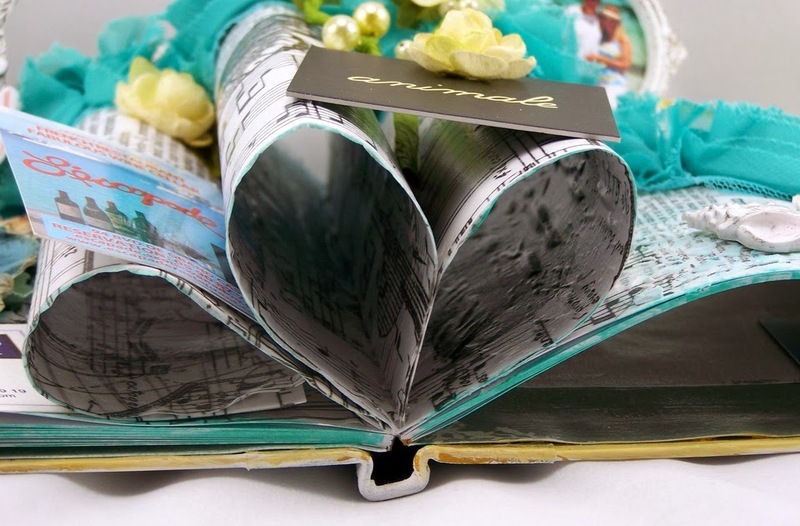 Here you can see how I covered the pages of the journal with the idea-ology TH Tissue Wrap called Melange. 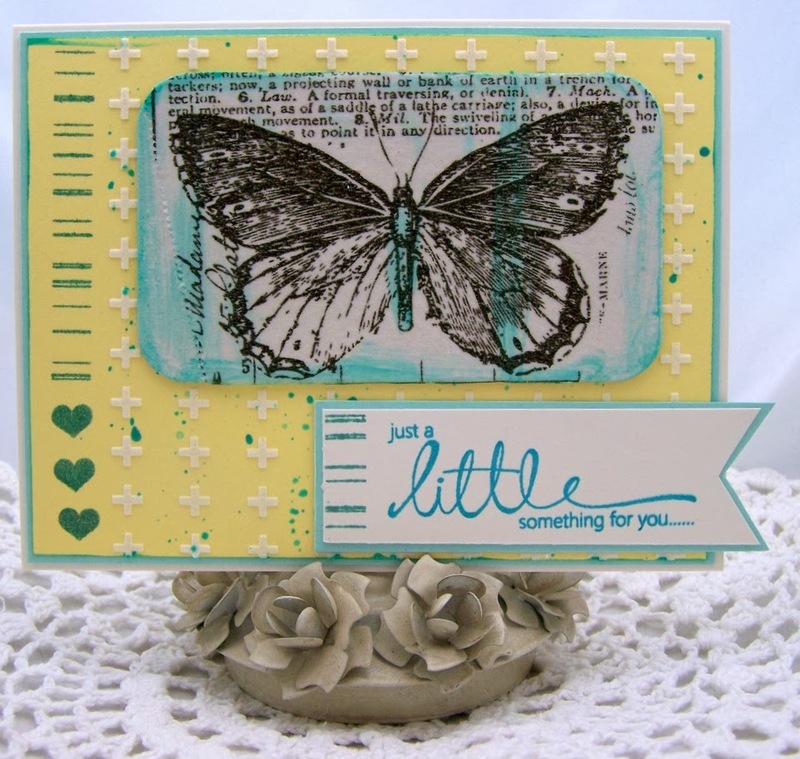 I LOVE the black and white text, sheet music, and butterfly BG for the turquoise and yellow colors in my altered book. If you look closely, you can see the Splash of Color Silk Acryllic paint in Guatemalan Green I used on the page edges. It has a FAB shimmer in real life! I wanted to show in this photo how the left side is flat, three pages in the middle are rolled, and the right side stays raised because it slides into a metal trinket at the edge of the book. This is the Prima metal trinket and the inside cover of the altered book. The inside book cover features Authentique Glistening papers from a 6 x 6 paper pad. I used another Prima Typewriter Key paper clip which I glued into the center of the trinket. I was able to add my journaling inside a business card from one of our FAV restaurants. The other business card is the home we rented on St. Barts. 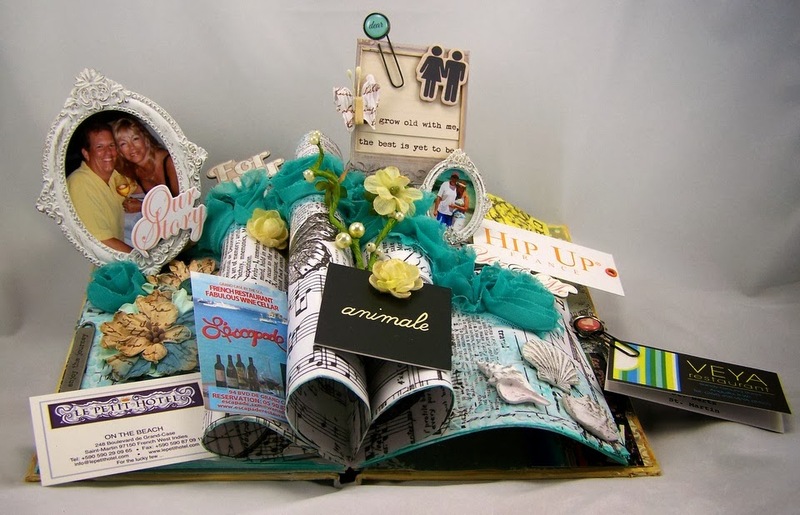 Come Play in our ePlay Altered Book Challenge and Push Your Boundaries! Wow, what a fabulous transformation, I love everything about this beautiful creation. 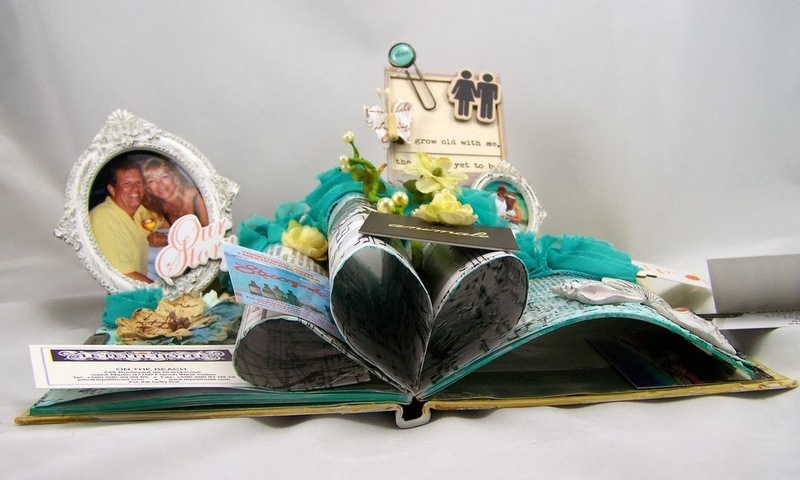 Sue I am in love with your altered book, truly stunning work of art and a treasured keepsake for sure! 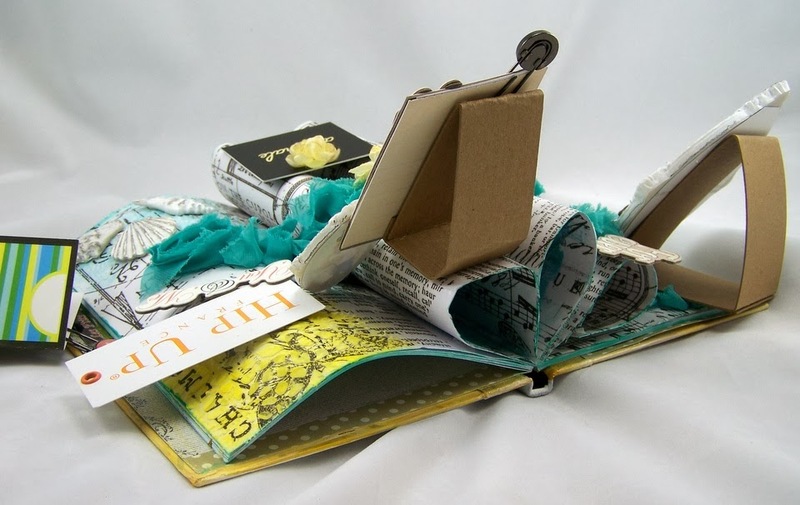 That is one heck of an awesome altered book. I love it.... love that it is more of a show piece, to be displayed. Beautiful.